Perfect weight and size for mans hankie. I was highly impressed with the quality of it. Beautifuly m.. I purchased this handkerchief for my son for his wedding day. The embroidery is perfect and the hank.. Wanted something to give to my son for his wedding day you know we always say something old, somethi.. 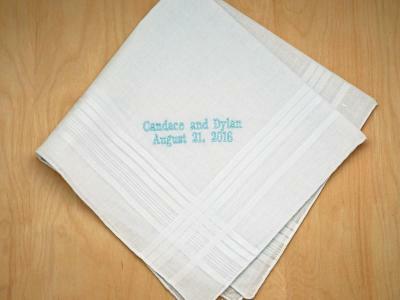 The handkerchiefs are high quality and the personalization was beautifully done and exactly as I had..